There’s an old joke where you ask someone what’s the most important thing about comedy. When they get to about the word “important,” you interrupt them and say, “Timing!” Perhaps the same thing can be said for photography. [Ted Kinsman’s] students at the Rochester Institute of Technology would probably agree. They built an Arduino-based rig to do inexpensive stop action photography. 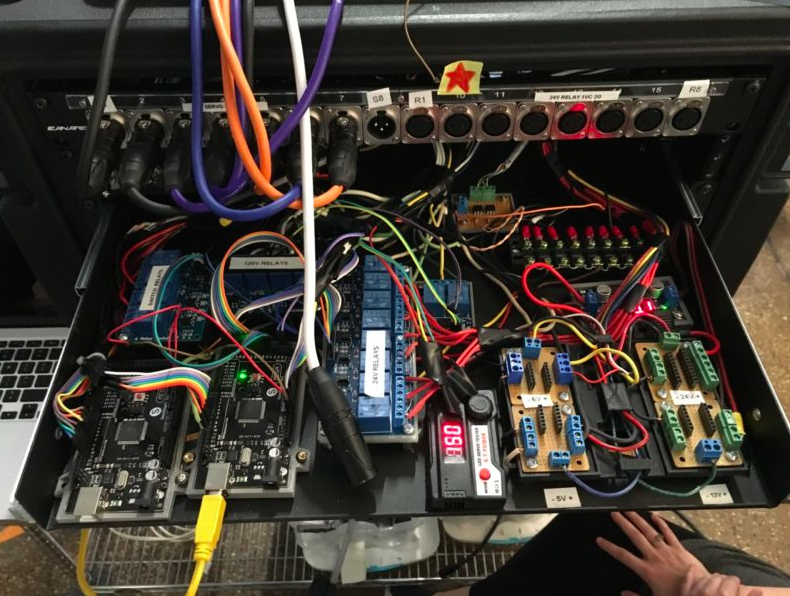 As Arduino projects go, it isn’t very sophisticated. The circuit contains a sound detection module and an optoisolator. The code would easily fit on a piece of notebook paper. When a loud sound occurs, the Arduino triggers the flash. Simple enough, but the resulting pictures are amazing. It also looks like a lot of fun to destroy perfectly good things in the name of art. If you are interested in photography, there are enough photos of their setup to give you some ideas about lighting, reflectors, and camera angles. If you are not a photography fan, you still should check out the post to see more of the pictures the students took. Interestingly, [Dr. Harold Edgerton] at MIT pioneered this technique starting back in 1937 and you’ve probably seen some of his famous photographs like the bullet through the apple or the milk drop crown. He used the same techniques to take photographs of the atomic bomb tests in the 1950s and 1960s. You don’t have to use sound as a trigger, by the way. We’ve seen lasers do the trick. And while the Rochester group’s build was simple, we’ve seen some even more bare-bones. If you’ve ever seen a TV commercial for any fast-food chain, then chances are you’re familiar with the burger drop shot–you know, that scene where ingredients like lettuce, tomatoes, onions, bacon, beef patties and sesame seed buns fall from above and then stack themselves upon landing. Well, photographer/Maker Steve Giralt wanted to try capturing a shot like this on his own without the use of CGI or an expensive post-production process. 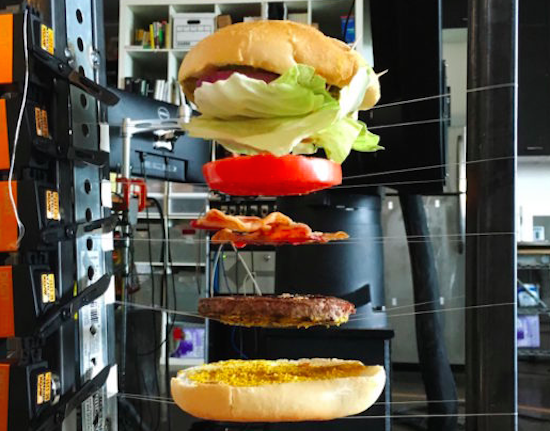 To accomplish this, Giralt created a rig with an Arduino-based timing control system (named P.A.T.R.I.C) that triggers the camera motion, as well as the drop of the burger’s ingredients so that everything falls perfectly. The final video is a synchronized work of art. In the half second of real time, multiple Arduino controlled servo motors with custom 3D printed scalpel blades cut through elastic bands holding up the top bun, pickles, onions, lettuce, tomato, bacon, meat, and lower bun while a 3D printed air powered catapult launched ketchup and mustard blobs into each other. This all happened while the Phantom camera was moving down on the motion control robot arm at high speed, adjusting focus, as it raced the ingredients and gravity down to the landing. When we got a perfect landing of the burger, I had a hand model slam down a freshly poured beer down next to the burger to finish off the shot. It was so much fun! You can read all about the build here, and get a behind-the-scenes look in the video below! Blackmagic's new 3G-SDI Arduino shield will make automating your camera and photography rig easier than ever with SDI input and output. The post Control Your Camera Rig with the Blackmagic SDI Arduino Shield appeared first on Make: DIY Projects and Ideas for Makers. Using many light sources, reflectance transformation imaging (RTI) is a method for photographing that allows you to get 3D map of surfaces. The post Shoot Super Detailed Macro Photographs with an RTI Camera Rig appeared first on Make: DIY Projects and Ideas for Makers.